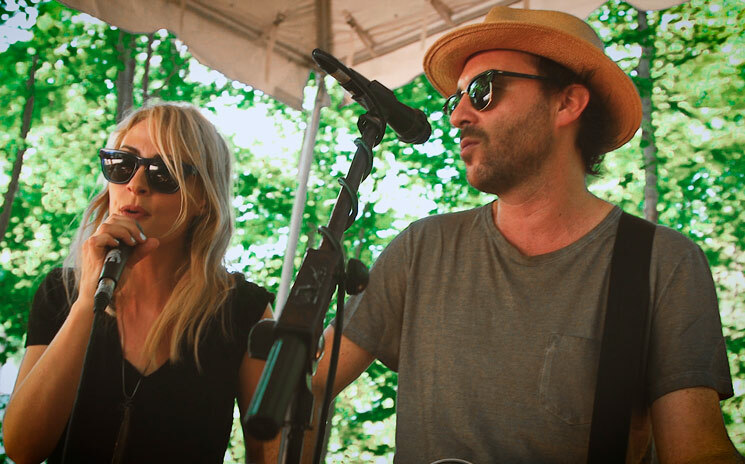 Chances are, if you're a fan of Canadian indie rock, Metric has been on your radar in one form or another. Emily Haines, James Shaw, Joshua Winstead and Joules Scott-Key's musical evolution from their beginnings in the early 2000s until now has found them exploring genres ranging from gritty hard rock to electronic synth-heavy pop and appealing to vast audiences and critics alike while progressing naturally from album to album. For this episode of Exclaim! TV, we met up with Haines and Shaw for a special acoustic session at WayHome Music & Arts Festival. Performing a single off last year's sparkly, refined Pagans in Vegas LP, the band members take "Cascades" in a completely different direction from the original studio recording. In place of the glittery synths and any trace of percussion, Shaw strums his acoustic guitar gently, while Haines employs her melodious, breathy vocals. The serene forest setting is perfect for the performance, as the trees blow gently around the musicians. Watch the acoustic set in the player below and check out their upcoming tour dates after the jump.